The entire English village inside Busch Gardens is getting a makeover to go with the new show. The Globe is being redesigned to take advantage of the latest technology in lighting, audio and stage design, including the use of projection mapping, ear-bending sonic soundscapes and a raked stage similar to performance stages used in European opera houses. Outside, the village will be decked out with new life and energy that embraces the roots of rock-n-roll with feelings of love, hope and freedom. “Guests will feel the thrills and excitement of being rock stars in the heyday of rock-n-roll London as they walk through Busch Gardens’ English village,” Gasparich said. 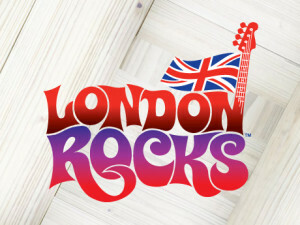 London Rocks will debut in spring 2014 and is among the many reasons to visit Busch Gardens next year, including the return of the Busch Gardens Food & Wine Festival and popular Busch Gardens’ concert series. Long before 2014’s British invasion, guests this fall will experience London’s more sinister past when Howl-O-Scream opens Sept. 13 and Busch Gardens’ England becomes Ripper Row®, one of four new Terror-tories. France, Italy, Germany and England are being transformed into over-the-top thematic experiences that transport guests to another time and place full of startles and frights. A Busch Gardens Fall Fun Card provides unlimited admission to Howl-O-Scream for the price of a single-day ticket. Visit howl-o-scream.com/va for complete details. Leave the frights behind this Christmas season and visit Busch Gardens starting Nov. 22 when it transforms into a winter wonderland during this most wonderful time of the year. Christmas Town is opening one week earlier this year to meet the demand for this popular family tradition. Now in the event’s fifth year, families are growing up with Christmas Town’s blanket of six-million glittering lights, breathtaking shows and traditional Christmas culinary delights. Visit Santa at his North Pole workshop and begin a Christmas Town tradition that is warm as apple pie, then take a step into the not-so-distant-past at Holiday Hills™ where mid-twentieth century Christmas celebrations come to life. Sip some of Busch Gardens’ signature peppermint fudge hot chocolate and let the warmth of the season take over. Pass Members can enjoy unlimited admission to Christmas Town with a Christmas Town Pass add-on to their active Annual Pass. For the latest information about Busch Gardens, visit www.buschgardens.com/va. Busch Gardens’ fans can like Busch Gardens Williamsburg on Facebook at facebook.com/buschgardens and follow Busch Gardens Williamsburg on Instagram and Twitter at BuschGardensVA.